Download Cambridge Speaking Test Preparation Pack For IELTS With PDF & Video File has been updated on 25th October 2016. Please download it as soon as possible before removing. 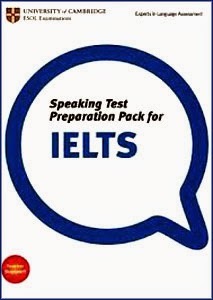 Cambridge Speaking Test Preparation Pack for IELTS is a comprehensive teacher resource pack from Cambridge ESOL to help teachers who are preparing students to take the IELTS Speaking Test. Written by experienced examiners, it includes student worksheets with teacher's notes, two sets of candidate visuals for Speaking test practice in class, and a DVD of students taking an IELTS Speaking test. So, students can see what they will have to do on the day of the test. Here, I have shared Cambridge Speaking Test Preparation Pack for IELTS With Pdf And Video File for you only getting a good band score in IELTS Speaking Test. Don't worry, it is ads free and error free. There is no error. Please check it again. This "Whoops! There was a problem with the preview. Retrying..." message is normal from Google Drive.